DILLEY, Texas (CNS) — Five Catholic and Evangelical Lutheran bishops traveled to the Dilley Detention Center in south Texas March 27 and visited with families — young mothers with children from Central America — who are being detained there. Last year, more than 68,000 families from Central America fled violence in their home countries. Many are being detained rather than released into alternative programs that provide them with case management and community support. The faith leaders called upon the federal government to halt the practice of detentions, citing the harmful effects on the mothers, children, and society. Archbishop Gustavo Garcia-Siller of San Antonio, whose archdiocese includes Dilley, was joined by Seattle Auxiliary Bishop Eusebio L. Elizondo, chairman of the U.S. Conference of Catholic Bishops’ Committee on Migration; and Bishop James A. Tamayo of Laredo, a border diocese which was on the front lines in dealing with the surge of immigrants from Central America last year. Bishops Michael Rinehart and H. Julian Gordy of the Evangelical Lutheran Church in America also joined the Catholic prelates on the visit. That same day, a letter calling for the end to the detention of immigrant families was sent to President Barack Obama. It was signed by 80 religious leaders representing the Jewish and Christian faiths. Since last summer, the U.S. Department of Homeland Security has detained hundreds of families at detention centers in Texas, Pennsylvania and New Mexico. In addition to the Dilley facility, mothers and children fleeing their homelands also are being held at a center in Karnes City, which is located in the Archdiocese of San Antonio as well. On March 31, the Washington-based Catholic Legal Immigration Network, known as CLINIC, announced that it and several other immigrants’ rights and legal services agencies are establishing a family detention project to provide legal services pro bono to children and their mothers detained in Texas at the Dilley and Karnes City facilities. CLINIC’s news release said the groups also will advocate for the end of family detention, which it said “is not only inhumane but also incompatible with a fair legal process.” It said the Obama administration’s “continuing commitment to the flawed deterrence policy” is evident in its plans to expand the detention capacity at the Texas facilities and the opening of a New Mexico facility last June. 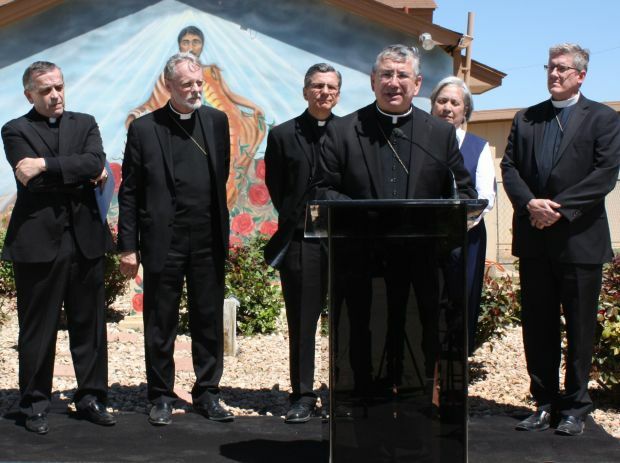 “So many of these mothers and children are detained in my archdiocese; they hold a special place in my heart,” said Archbishop Garcia-Siller at a bilingual news conference at St. Joseph Church in Dilley following the visit and tour. The archbishop told of recently visiting those being detained in Karnes City. While there, he met a mother who gave birth to her child while she made the terrifying journey to escape violence in her home country. While he talked with her, she tearfully described her pilgrimage of what she hoped would be freedom and safety. Archbishop Garcia-Siller emphasized that there are humane alternatives to the detention of these families, where they could be cared for in the community and provided appropriate support, including legal representation. “We should not continue to expand bed space for these families, but pursue alternatives. The moral character of a society is judged by how it treats the most vulnerable in its midst. Our nation’s family detention policy is shameful and I implore our elected leaders to end it,” he concluded. The bishop added that the current policy does not deter family migration, as the forces compelling families to leave Central America are much stronger than any deterrent threat detention may create. Bishop Elizondo focused on other ways to ensure that families appear at their court proceedings, most importantly by giving them legal representation. The bishop told of domestic and international legal obligations toward these families — the large majority of whom are eligible for asylum under our system, he said — but by detaining them, the United States is denying them due process, as the immigrants are unable to access legal representation or understand their rights. McMorrough is editor of Today’s Catholic, newspaper of the Archdiocese of San Antonio.